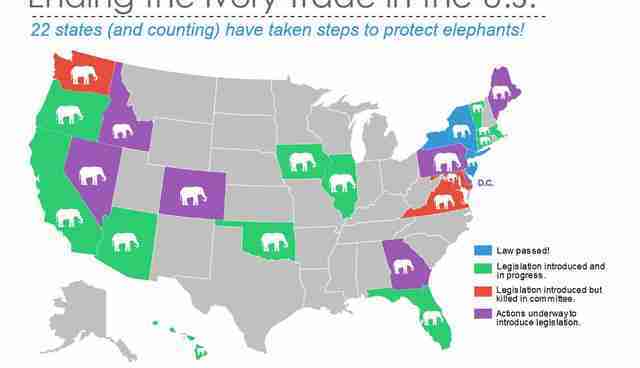 Is Ivory Trading Legal In Your State? There is a galvanizing movement underway in America to save elephants from extinction by banning ivory sales. 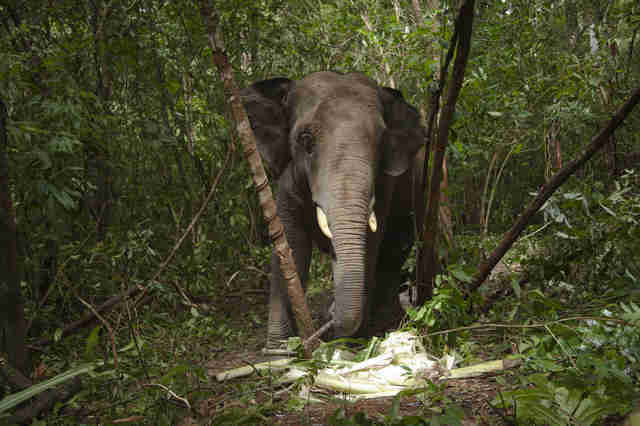 100,000 wild elephants were slaughtered for their tusks between 2010 and 2012. That equates to 1 elephant killed every 15 minutes. In February, Vermont introduced a key measure to completely ban its domestic elephant ivory and rhinoceros horn commerce, joining nearly 20 states taking action to eliminate the ivory trade in 2015. With California at the helm, these states are working to pass bipartisan legislation that can have a sweeping impact on protecting elephants and rhinos from the threat of extinction. In 2014, New Jersey and New York made history as the first states to pass stronger ivory trade restrictions. New Jersey's law, a full ban on all ivory and rhino horn sales in the state, took effect this past February. "The global trade of elephant ivory and rhinoceros horn is thriving, fueled by the slaughter of an estimated 35,000 elephants annually, and supported by the sale and purchase of ivory and rhinoceros horn products at home," said New Jersey State Senator Raymond Lesniak, who led the charge to ban ivory and rhino horn sales in the Garden State last year. He also led the second annual International March for Elephants to the White House from the Lincoln Memorial on Oct. 4, 2014. 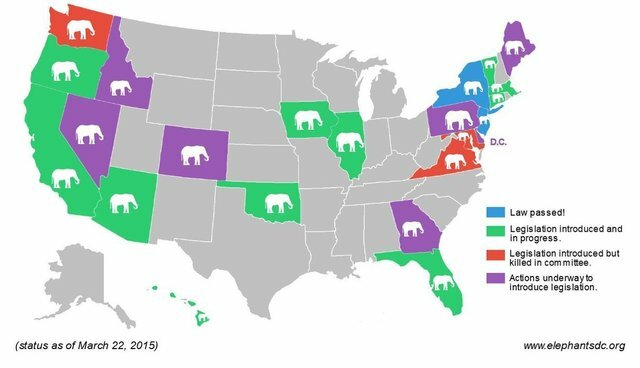 Inspired by New Jersey's lead, a dedicated herd of nonprofits, grassroots groups and elephant and rhino advocates have been working tirelessly in partnership with lawmakers of both political parties to institute similar laws protecting elephants in the rest of our nation's states. As of March 1, a plethora of diverse states - including California, Vermont, Illinois, Massachusetts, Hawaii, Florida, Oklahoma, Virginia, Maryland, Washington State, Iowa and Connecticut - have all introduced similar measures to end ivory and rhino horn trade in 2015. In addition, action is underway to introduce ivory sales bans in Colorado, Nevada, Idaho, Oregon, Pennsylvania, Delaware and the District of Columbia. What's at stake in the state ivory bans? The ivory bans sweeping the nation come at a critical time for elephant populations worldwide. The US Fish and Wildlife Service reports that elephants are being poached faster than they can procreate. At this rate, elephants could become extinct in the wild in as little as 10 years. Yet elephants are key species needed on the earth to protect ecosystems, biodiversity, and forests. The time to fight extinction is now, by ending the ivory trade once and for all. Banning ivory sales also combats a violent illegal wildlife trafficking industry that funds terrorism. The ivory trade puts money in the hands of terrorist groups including Al-Shabaab, Boko Haram, Janjaweed, and the Lord's Resistance Army, who use the profits from slaughtering elephants to buy weapons and inflict terror on innocent victims. In addition to the amoral ivory trade, elephants are being exploited in other ways. 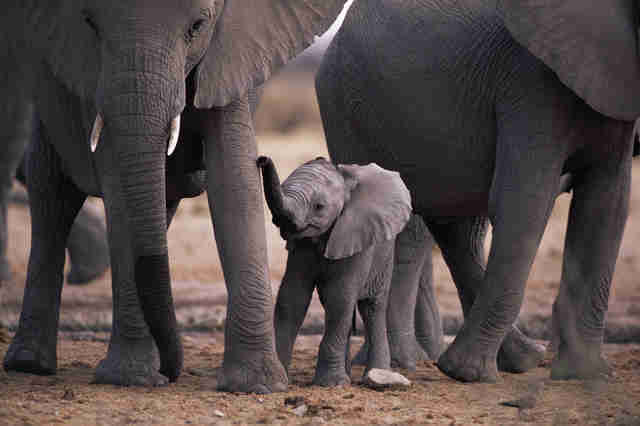 Recently, Zimbabwean government officials kidnapped more than 80 milk-dependent baby elephants from their families in the Hwange National Park for exportation to Asia. "In my view, one of the most insidious forms of corruption and criminality in the world today is the illegal wildlife trade," said Britain's Prince William, Duke of Cambridge, while visiting Washington DC last December. "Gangs turn vast profits from the illegal killing or capture of wildlife; armed groups and terrorists swap poached ivory for guns; and middle-men oil the wheels of the trade in return for reward. Together they loot our planet, to feed mankind's ignorant craving for exotic pets, trinkets, cures and ornaments derived from the world's vanishing and irreplaceable species." Why are the state bans so important? Action at the state level is important to bolster and support action at the federal level and to close lingering loopholes that allow the blood ivory trade to thrive. Last year, in a momentous action, the US government recognized the crisis posed by the brutal wildlife trafficking industry. In February 2014, President Obama announced a new National Strategy on Combating Wildlife Trafficking that called for intergovernmental cooperation and reinstated a US ban on commercial African elephant ivory imports. The presidential task force recently announced its implementation plan in February 2015. However, the President's National Strategy will remain limited in ending all US ivory trade until federal lawmakers pass legislation strictly banning all ivory imports, exports, and sales. And all too often, federal lawmakers are slow to act. Moreover, the President's rules do not address ivory commerce within a state's borders. This leaves loopholes open that only states have the power to close. That's why action at the state level is critical to end the continuing ivory commerce within the United States. The states of New Jersey and New York took action last year to close the loopholes and ensure they have no part in the nefarious ivory and rhino horn trades. They made a powerful statement to the nation and the world that terrorism and extinction are not an option. This year, nearly 20 states - and counting! - are doing the same. "I am greatly encouraged that states across the nation - from California to Vermont and from Massachusetts to Iowa - are taking necessary action to ban domestic ivory and rhino horn sales, following our lead in New Jersey," said Senator Lesniak. "We have a duty to treat all animals - as creations of God - with care wherever they roam the earth - and certainly not contribute to their extinction. Let's continue to move forward for a more humane nation." While approximately 20 states are taking action to end the ivory trade in their states, some are further along than others in the process. A few of them have key hearings this week. Bill introduced; currently in committee. California impacts 20 percent of the US economy and has our nation's second largest market for ivory. That's why it's key that the Sunshine State bans ivory trade with no further exemptions. Upcoming Hearing: The measure (AB 96) will be heard before the California State Assembly, Water, Parks, and Wildlife Committee, at 9:30 a.m. PST March 10 at the State Capitol in Sacramento. For more info and actions on how you can show your support, click here. Bill introduced and moving quickly. Hawaii has the third largest market for illegal ivory in the United States. Support for an ivory ban is strong, but the opposition is also vocal. For more information on ongoing efforts to end the ivory trade in Hawaii, click here. For more information, including how to show your support, click here. Upcoming Hearing: The bill, HB0713, will be debated before the House Judiciary Committee in a hearing scheduled for 1 p.m. March 4 at the Maryland House Office Building, Room 100, 6 Bladen Street. For more information, including how to show your support, click here. Four bills introduced by four lawmakers. Introduced in January; died in committee. Action underway. Learn more and sign the petition at ivoryfreecolorado.org. Action underway. 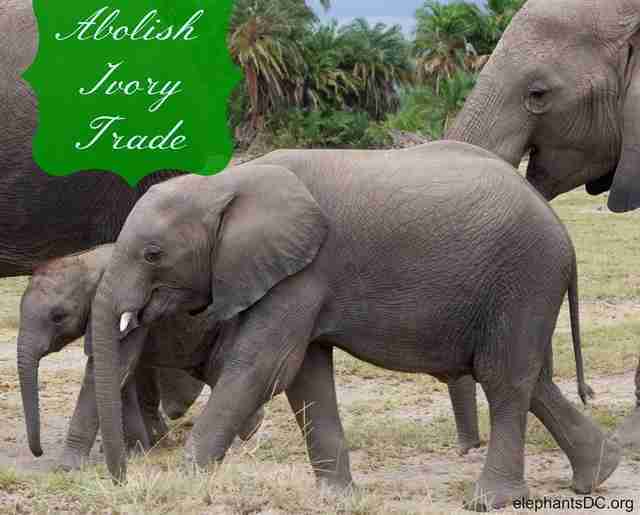 Learn more and sign the petition at ivoryfreedc.org. Banning ivory sales nationwide is a vital step to ending the ivory trade worldwide. We must do everything we can to ensure future generations grow up in a world where elephants - and our humanity - still thrives. Once, millions of elephants roamed Africa; now, only a few hundred thousand remain, slaughtered at a rate of 96 each day to feed the world's consumption for unnecessary ivory products. Ending the ivory trade saves elephants from extinction, benefits future generations and stamps out illicit funding used by transnational criminals and terrorists. Concurrently we must root out demand, build up eco-friendly communities, invest in nations protecting their environments and empower law enforcement to bring wildlife traffickers to justice by eliminating endangered species trade loopholes. 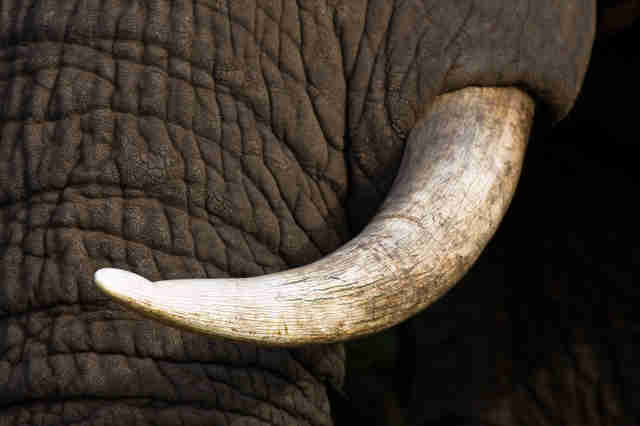 Illegal ivory hides behind the guise of "antique," "bone," "mammoth," and even "jewelry." Once illegal ivory hits the market, we have already lost. You can help by supporting actions in your state to stem the tide and save elephants. After all, children learn that "E" is for "Elephant" - not "Extinction." Contact your representatives; write letters to the editor; tell your friends and family about the cause. Strong grassroots support from people like you can make all the difference. We must, we can and we shall ban ivory sales to save elephants from extinction! For more information and tips on how to get involved, visit our website at www.elephantsdc.org and follow us on Facebook and Twitter. Together, we can make a difference for elephants!